Homeostasis is the process the body takes to maintain equilibrium. Because of this process, one can take note on the body changes that come with the process, such as change in skin color, changes in hear rate and perspiration level, body temperature, etc. Our class did the Homeostasis Lab in order to greater understand the process of homeostasis through exercise of a fellow classmate. We got into groups of 3-4 and had one group member do a series of exercise for several minutes. As the lab went on, we saw a change in body color, perspiration level, body temperature, heart rate, breathing rate, oxygen saturation, and blood pressure. We noticed as the exercise increased in intensity, the levels increased or went up. The picture attached shows an example of one of my group’s charts from the lab on the change in heart rate. 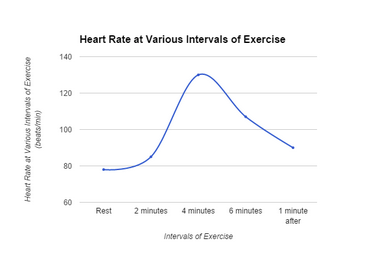 You can see by the graph that as the exercise intensity increased, so did the heart rate. However, once the body rested, everything began to fall back down to normal. This lab was a great way to visually teach us how our body undertakes homeostasis on a daily basis, and by relating it to something everyone is familiar with; exercise. Here is one of the graphs that was in my group’s lab write-up. This graph shows the changes of heart rate that went on during the experiment. You did a great job of describing the procedures of the lab and explaining the data you would be collecting. It would be helpful to include your data table or other graphs so that your reader can see all of your results. You explain what results your observed, but not why you observed them – for instance, why did heart rate increase during exercise? Looking forward to future lab posts!